Wineries are tucked into just about every neighborhood in Seattle, from office parks in SoDo to basements in Ballard. In contrast to wineries in less populated areas, which often announce their presence with large signs and spacious buildings, Seattle’s urban wineries often blend into the city where, if you don’t look closely, you might not even notice they are there as you walk by. Once such urban winery is Eight Bells Winery, which is shoehorned into an alleyway off Roosevelt Way Northeast in Seattle’s Ravenna neighborhood. The winery is owned and operated by the triumvirate of Tim Bates, Andy Shepherd and Frank Michiels. Eight Bells gets its name from the bells that toll each half hour on a ship, with the eighth bell signaling the end of a sailor’s watch. For Bates, Shepherd, and Michiels, the name signifies both a change in careers and their transition from home to commercial winemakers. 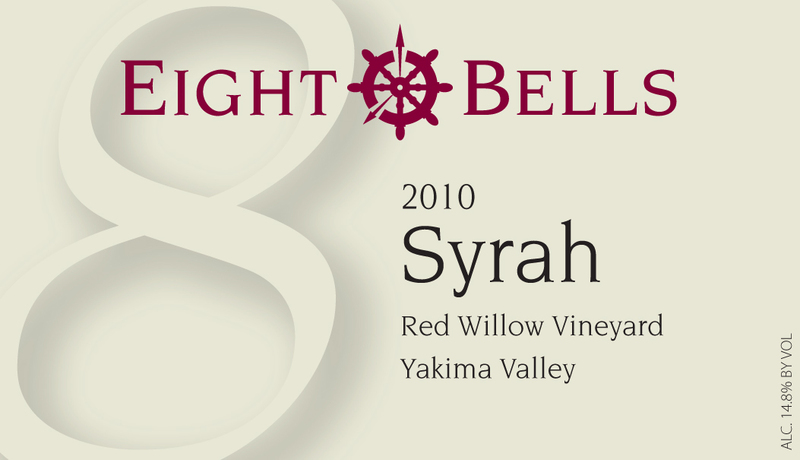 The story of Eight Bells begins all the way back in 1980 when Tim Bates – a Ph.D. chemist at the National Oceanic and Atmospheric Administration (NOAA) - took a wine class at South Seattle Community College. The class was taught by Chateau Ste. Michelle winemaker Joel Klein. 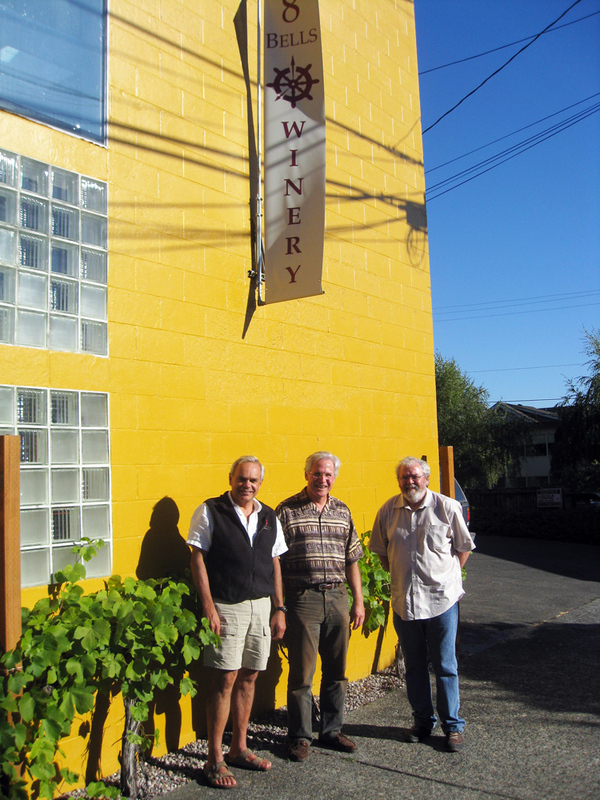 With Bates’ interest in home winemaking piqued, Klein invited him to Ste. Michelle to pick up a gallon of starter. The jug was filled by none other than Kay Simon, who shortly thereafter started Chinook Wines with Clay Mackey. Bates started out making wine from 100 pounds of grapes, then 200, then 500. Come 1996, his friend and NOAA co-worker Andy Shepherd joined him, and they soon began getting grapes from friends who were in the Boeing Wine Club. “That was a giant step up,” Bates says, with the Boeing connection providing them with access to some of the state’s top vineyards. Bates and Shepherd called their amateur label ‘Shellback Vintners’ after a term for a sailor who has crossed the equator. In 2006 their friend Frank Michiels came over to watch crush. They sent him home with some grapes, and soon he too was bit by the bug. As an urban winery, space at Eight Bells is at a premium. Every square foot of the winery is utilized. On one wall, barrels are stacked high behind a padded curtain in a temperature controlled area. On the other are stainless steel tanks. In between are barrels with the current vintage and up above on a mezzanine is storage. Come harvest time, they clear the mezzanine and forklift grapes up before sending them down the crusher-destemmer and into fermenting bins. “Everything needs to have three or four different functions,” Michiels says of the way they approach the space. Unique for a winery this size, Eight Bells has a full, in-house laboratory upstairs where they do all of their testing on the wines, leveraging Bates’ skills as a chemist. “We can stay on top of the wine this way at very little cost,” Michiels says. In terms of fruit, many of the Eight Bells wines come from Red Willow Vineyard, and Bates, Shepherd, and Michiels are each effusive in their praise of grower Mike Sauer. “He’s been caring for those plants since 1973,” Michiels says. “He knows every single plant!” The winery also uses fruit from Ambassador Vineyard on Red Mountain as well as Methven Family Vineyard in the Eola-Amity Hills. Despite the exceptional pedigree of the fruit, the Eight Bells wines are extremely well priced. “We’re aggressively pricing everything,” Michiels says, noting that their goal is to sell as much wine directly out of the tasting room as possible. Stylistically, the wines are all fresh, soft, and supple with considerably less extraction and use of new oak than is often found in Washington. Eight Bells is currently open every Saturday from 11am to 4pm. Beyond these times, it simply blends right into the neighborhood. The winery makes between 1,500 and 2,000 cases of wine each year, and that’s where they intend to stay. “That’s all three old men can do!” Michiels says with a chuckle. (Good/Excellent) An aromatically pleasing wine with red apple, pear, mineral, and spice. The palate is medium bodied with crisp, tart acidity and a lingering, green apple filled finish. 95% Pinot Gris (Methven Family Vineyard, OR) and 5% Viognier (Red Willow). 13.1% alcohol. 270 cases produced. (Good) A moderately aromatic wine with spice, straw, stone fruit, and candy corn. The palate is clean and fresh, on the lighter side of medium bodied with a refreshing tartness. 100% Chardonnay. Aged in stainless steel (84%) and five months in new French oak. 13.0% alcohol. 290 cases produced. (Good) An aromatic wine with bright cranberry and raspberry aromas and a light herbal tone. The palate is light bodied with fresh, tart fruit flavors with minimal oak influence. 100% Sangiovese. Aged in oak (15% new). 14.7% alcohol. 175 cases produced. (Good/Excellent) Lightly aromatic with herbal tones and red currant. The palate is soft and incredibly smooth with supple fruit flavors and a lingering, fruit filled finish. A delightful bottle of wine at a can’t-be-beat price. 100% Merlot. Les Vignes de Marcoux Vineyard (1990 plantings). 14.2% alcohol. 177 cases produced. (Good) Medium ruby. An aromatically fascinating wine with penetrating anise aromas and high toned spices. The palate is very soft with cherry flavors accented by oak spices with well integrated tannins. 80% Cabernet Sauvignon, 20% Merlot. Ambassador and Hedges vineyards. 14.6% alcohol. 128 cases produced. (Excellent) An aromatic wine with clove, spice box, and sweet fruit. The palate is full of silky cherry and brambly fruit flavors. Very high on the delicious scale. 40% Cabernet Sauvignon (Ambassador), 40% Merlot (Hedges, Marcoux) and 20% Syrah (Red Willow). Aged in French and Hungarian oak. 125 cases produced. (Good/Excellent) An aromatic wine with brambly fruit, blueberry, spice, pencil lead, and a light smoked meat note. The palate is very soft and light in feel with abundant blueberry flavors. 95% Syrah, 5% Grenache. (Excellent) A moderately aromatic wine with vanilla, wild blueberries, mineral and red fruit. The palate has sweet, luscious, plush fruit flavors accented by chocolate. Again, high on the delicious scale. 85% Syrah (Red Willow) and 15% Grenache (Red Mountain). 14.7% alcohol. 200 cases produced. (Excellent) Dark in color. A moderately aromatic wine with mineral, bacon fat, and light herbal tones. The palate has elegantly styled, deliciously pure fruit flavors. 100% Syrah. Red Willow (2006 planting). Aged in oak (50% new). 14.8% alcohol. 187 cases produced. (Good/Excellent) Hailing from Red Willow’s ‘Clonal Block’ of Syrah which was planted in 2005 to eight different clones of Syrah, this is a lightly aromatic wine with vanilla, smoke, and dark fruit. The palate has soft fruit flavors and velvety tannins. 95% Syrah and 5% Grenache. Aged in American (60%), French (20%), and Hungarian oak. 14.8% alcohol. 129 cases produced. I love Eight Bells wines. My favorite are their Syrahs - all of them! What a great write up, Sean. Thanks!